By selecting and starting an appropriate recipe, the FTPadv reflectometer gives thickness measurement in less than 100 ms with precision of less than 0.3 nm and in a thickness range of 50 nm – 25 µm. Operator errors are reduced to a minimum by the comparison between the measured reflection spectrum and the spectra library. A large material library based on SENTECH most accurate spectroscopic ellipsometry measurement supplies recipes for the measurements of optical constants of new materials. For 20 years, SENTECH has successfully sold the Film Thickness Probe FTPadv for various applications. This table top reflectometer features thickness measurement of small samples up to large window panes, insitu or inline, at low or high temperatures, in industrial or research environments, by remote or direct control. The tabletop reflectometer FTPadv accurately and reproducibly probes thickness and refractive index of transparent and weakly absorbing films on reflective and transparent substrates. The FTPadv Options: Adapters for different microscopes FTPadv Expert software Certified SENTECH wafer can be attached to a microscope or be equipped with a stabilized light source for thickness measurement of layers up to a thickness of 25 µm (thicker on request). The extensive database of predefined, customer proven, and ready to use applications benefits from SENTECH spectroscopic ellipsometer experience. The FTPadv features the thickness measurement of any layer from a multilayer sample making the FTPadv the ideal cost-effective solution for film thickness measurement. The FTPadv for process control Options: Adapters for different microscopes FTPadv Expert software Certified SENTECH wafer comprises an optical fiber bundle with post and sample holder, a stabilized light source with halogen lamp, and the FTP optics and controller station. LAN connection to PC allows remote control of the FTPadv in industrial applications like harsh environment, special protected rooms or large machinery. The reflectometer FTPadv comes with a huge number of predefined recipes , such as dielectrics on semiconductors, semiconductors on semiconductors, polymers on silicon, films on transparent substrats, films on metallic substrates, and others. The unique AutoModel feature allows the detection of sample types by fast comparison with spectra library. This reflectometer reduces operator errors to a minimum. Film thickness measurement by optical reflection have never been so easy. 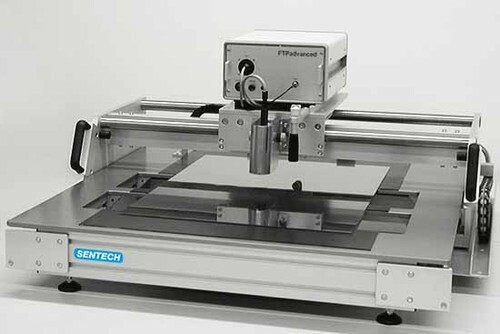 SENTECH FTPadv menu driven operation software permits thickness measurement of single and multiple layer structures with excellent operator guidance. Furthermore, it features powerful analyzing tools and outstanding reporting functionality. Additional mapping software is available to control a motorized sample stage. Upgrading the software to the software package FTPadv EXPERT for advanced analysis of reflection measurements extends the standard software package by the application of materials with unknown or not constant optical properties. So thickness measurement and the analyze of refractive index and extinction coefficient of single films is possible. SENTECH FTPadv menu driven operation software permits thickness measurement of single and multiple layer structures with excellent operator guidance. Furthermore, it features powerful analyzing tools and outstanding reporting functionality. Additional mapping software is available to control a motorized sample stage. Upgrading the software to the software package FTPadv EXPERT for advanced analysis of reflection measurements extends the standard software package by the application of materials with unknown or not constant optical properties. So thickness, refractive index, and extinction coefficient of single films can be analyzed.